The Havana Silk Dog is a purely Cuban invention, and is attractive, fun-loving, charming, alert, resourceful, and highly adaptable to any situation. 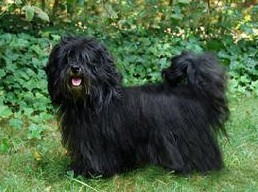 He is a small, elegant, but athletic companion dog with long, flat, silky hair of various colors. His pride and poise are reflected in his typically high head and tail carriage, and his smooth, elastic gait. Size- 9 to 11 inches. Weight in proportion to height. Proportion - height at top of shoulder equals the distance from top of shoulder to set-on of tail. A well-balanced dog is approximately one-third head and neck, one-third body, and one-third leg. Substance - medium bone throughout, neither coarse nor fine. Length of head - measured from tip of the nose to occiput, is about 50% of the height at top of shoulder. Expression- Caring, curious, and intuitive. Eyes - Set well apart, rather large, very dark. Eyelids almond-shaped. Blue eyes disqualify. Ears -Set high on skull, broad based, with a distinct fold at the line of the skull. Triangular in shape with fine leather whose tip touches the outer corner of the eye when gently held forward. Carried neither folded along the neck nor framing the cheeks. When alert, ears lift at the base, producing an unbroken line across top of skull. Skull - Broad and slightly rounded. Muzzle - Rather refined, the cheeks very flat. Length of muzzle in relation to skull is ideally 3 to 4. Mandible flat and firm. Nose - Broad, square, and always black except on the chocolate dog, which has dark brown pigment. Dilute pigment on the nose disqualifies. Pigmentation - of eye rims and lips is ideally black except on the chocolate dog, which has dark brown pigment. Any deviation from the ideal to be penalized to the extent of the deviation. A halo of dark pigmentation surrounding the eyes is very desirable. Dilute pigment disqualifies. Bite - Jaws align in a scissors bite. Neck - Moderately long to allow high head carriage. Length of neck approximates 50% of the length of body measured from top of shoulder to set-on of tail. Carries a slight arch and blends smoothly with the shoulders. Topline - Straight from the withers to the point of hip. Croup - Descends at a 30 degree angle from point of hip to set-on of tail. Length of croup measured from point of hip to base of tail is approximately 1.5 inches. Body - The body is a little longer than the height, allowing for greater reach and drive, with a clearly defined tuck-up. Ribcage is oval in shape, with ribs well-sprung off the spine. Chest reaches the elbows. Loin is short, broad, and well-muscled. Length of ribcage is approximately twice the length of loin. Forechest - is well defined. Tail – Set on so that it is naturally carried high and gracefully arched over the back. The tail may fall to either side. The vertebrae of the tail should not touch the back. The tail may drop when not in motion and should extend slightly past the hock. Shoulders - Laid on well, muscular, strong, and well laid back. Angle at point of shoulder approximates 100 degrees. Upper arm - Well-angled, with forelegs set well under the body. Forelegs - straight and parallel when viewed from any angle. Distance from floor to elbow is equal to the distance from elbow to top of shoulder. Ideally the distance from elbow to elbow equals the distance from bottom of the chest to the floor. Bowing of the forelegs or valgus deviation of the carpus disqualifies. Legs - strong and muscular with moderate angulation. When stacked, hind foot falls slightly behind a vertical line dropped from the ischium. Legs straight and parallel when viewed from the rear. Distance between the hind legs approximates the distance between the forelegs. Pelvis - Angle from the point of hip to ischium is ideally 30 degrees off the horizontal. Hocks - short and straight, parallel when viewed from the rear; not exceeding 30% of the height at the point of hip. Hind Feet- oval and compact. The adult coat is single, not dense, and is without an undercoat. The hair lies quite flat and is rather soft naturally forming light wispy waves at the ends of each strand. There are two coat patterns. Silk: A typical drop coat, with long silky hair entirely covering the dog. A curtain of hair falls forward from the occiput, covering the eyes. Satin: Hair on head, feet, and front of legs is short and fine. Body coat of moderate length, with longer, silky furnishings on ears, chest, backs of legs and tail. Any color or combination of colors, with the exception of merle, is equally acceptable as long as the nose is black, or dark brown on chocolate dogs. Merle pattern disqualifies. Smooth, elegant, and elastic. Movement is sound with good reach and drive. Head and tail are carried high while moving. A level topline holds under movement. The epitome of a companion dog: very outgoing, self-confident, lively, playful, curious, and intelligent. Should show friendliness and acceptance of people and other dogs, but does act as an alert dog. Any reservation towards strangers should resolve quickly upon introduction. Atypical temperament should be penalized. The foregoing description is that of the ideal Havana Silk Dog. Any deviation from the above described dog must be penalized to the extent of the deviation. Bowing of the forelegs or valgus deviation of the carpus disqualifies.